AN Inishowen-born Paralympian has been honoured after receiving The Irish Paralympic Order at The Irish Paralympics Awards. 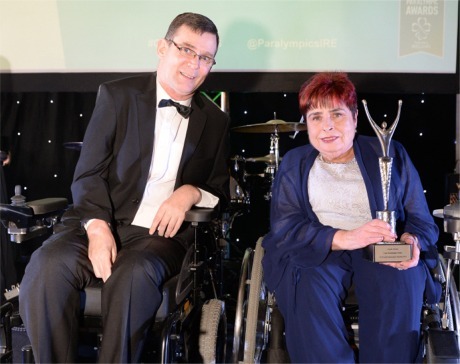 Angela Hendra was recognised "as arguably one of Ireland's most successful Paralympians", having won numerous medals in table tennis and lawn bowls at national, European and world level. Ms Hendra was born in Malin Head but moved to Derry at the age of 10. Two years later she was diagnosed with a tumour on the spine and spent fifteen months at Stoke Mandeville Hospital in Buckinghamshire, England, the 'birthplace of the Paralympic Games'. While receiving treatment under the care of Ludwig Guttman, the ‘father of the Paralympic Games’, she developed a strong interest in sport. Angela Hendra is presented with The Irish Paralympic Order by Paralmypics Ireland president Jimmy Gradwell. She played an active role in the work of numerous voluntary organisations including the Northern Ireland Paraplegic Association; Irish Wheelchair Association; British Wheelchair Sports Foundation; the Centre for Independent Living and Wheelchair Bowls Northern Ireland. Awarded an MBE in 1991, the Bangor-based award winner is also a former member of the Sports Council for Northern Ireland. She currently dedicates her life to improving the lives of people with disabilities in society and in sport and is a founding member and current vice chair of Disability Sport NI. "I thoroughly enjoyed my competitive years as a Paralympian and have equally enjoyed my many years in voluntary sports administration. It gives me great pleasure to see how sport transforms the lives of disabled people," the delighted honouree said.